Marlton, NJ – Samaritan Healthcare & Hospice recognized long-time volunteer Fran Shinn of Mount Laurel, NJ for 3,000 hours of volunteer time at its Winterfest celebration – an annual event that acknowledges employees and volunteers for their service milestones and dedication to the not-for-profit organization. Fran, 83, started volunteering for Samaritan in 2005 as an administrative volunteer in the development department and lending a hand at Samaritan’s annual golf tournament. Now, she assists the volunteer department by spending a few hours each week inputting volunteer patient-visit hours into Samaritan’s database. Over the years, she has entered more than 130,000 entries! Samaritan offers many ways to volunteer. If you are interested in learning more, please contact Sharon Wenner at (856) 552-3238 or swenner@SamaritanNJ.org. Fran Shinn.jpg – Fran Shinn of Mount Laurel was recognized by Samaritan Healthcare & Hospice for 3,000 hours of volunteer service to the organization. 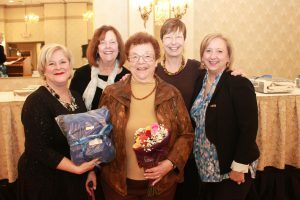 Pictured, from left: Sharon Wenner, volunteer recruiter, Samaritan Healthcare & Hospice; Sally Cezo, director of volunteer services, Samaritan Healthcare & Hospice; Volunteer Fran Shinn of Mount Laurel; Linda Brennan, volunteer coordinator, Samaritan Healthcare & Hospice; and Andrea Kinsey, volunteer coordinator, Samaritan Healthcare & Hospice.